Leatherman has a new tool called the “Feestyle” that is like the Skeletool except smaller and does not have the bit driver. It has only a pliers and knife and pocket clip. They also have a new line of LED flashlights that are lower priced. They will be $12 to $48 retail due in July. Also, a limited edition Damascus blade Wave tool with two damascus blades. Price will be about $500. It is due in March. Then there is a new “5” series that is an Assisted Axis lock! 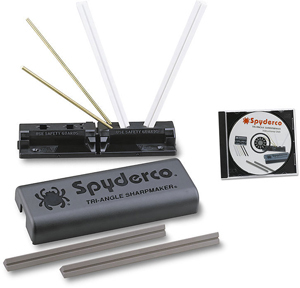 The thumb stud allows fast opening and the Axis mechanism releases the blade for closing. It’s not a Griptilian, but is a “5” series and should be available soon. 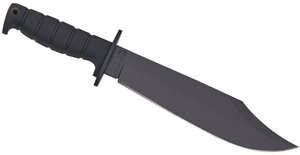 New Mono lock with Titanium handle and modified 4″ Tanto blade- a LUM design the LFTI. Should be available soon. One position pocket clip for “tip down” carry. The Torrents is an assisted liner lock with G10 handle with deep pocket clip- very dressy. Blade is 3.5″. The Monster new Mark Lee fixed blade memorializing the first Navy SEAL killed in Iraq with a great shape and feel. The new NIMCUB is a new version of the Nimravus with a minimalized molded sheath. Available now. The BM950 Axis lock at $180 retail. The Mel Pardue 522 and 527. There is a new Red Class with an anodized aluminum handle and a retail of under $100 and a button release of the handle. USA liner lock assisted opener. 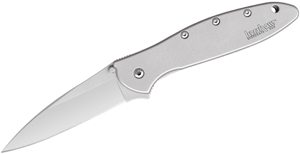 Small knife with 2″ blade and very fast action and $70 or $85 retail due in March. New tactical version of the pens that are much smaller in size either knurled or clean and small enough to fit in the pen pocket on military sleeves. Cold Steel: They are offering a line of pepper sprays which feature an additional bit of black pepper causing a sneezing reaction so that they will breath in more of the real pepper spray. The Spartan is based on the Kopis sword for the handle and have a Kukri style blade. The Paradox looks like a butterfly knife but is actually similar to the Black Rock model from last year and is spring shut and so is a two handed knife.